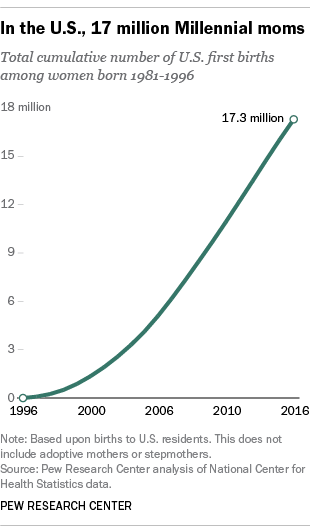 Some 1.2 million Millennial women gave birth for the first time in 2016, according to National Center for Health Statistics data, raising the total number of U.S. women in this generation who have become mothers to more than 17 million. All told, Millennial women (those born from 1981 to 1996) accounted for 82% of U.S. births in 2016. At the same time, Millennials made up 29% of the adult U.S. population and more than a third of the U.S. workforce (35%). While Millennials may be delaying parenthood, it’s not for lack of interest in eventually becoming moms and dads. Members of this generation rated being a good parent as a top priority in a 2010 Pew Research Center survey. Some 52% said it was one of the most important goals in their lives, well ahead of having a successful marriage, which 30% said was one of their most important lifetime goals. Regardless of which generation they belong to, parents say having children is central to their identity. Among Millennials, six-in-ten (60%) said that being a parent is extremely important to their overall identity, according to a 2015 Pew Research Center survey. A similar share of Gen X parents said as much (58%), as did a slightly smaller share (51%) of Baby Boomers with children younger than 18. Millennials not only feel good about their parenting, but they also seem to be having more fun with it than older generations. In the 2015 survey, they were more likely to say that parenting was rewarding (58%) and enjoyable (52%) all the time than were Gen X parents (51% and 39%, respectively) or Boomer parents (46% and 39%). One factor behind these generational differences in parenting perceptions is the fact that Millennials are less likely than parents from prior generations to have older children. Among parents from any generation whose oldest child is younger than 6, about half (52%) said that they were doing a very good job parenting, according to the 2015 survey. But the share who said this dropped to 42% among those whose oldest is a teenager. The same pattern persists on other questions. Some six-in-ten parents whose oldest child is younger than 6 said parenting was rewarding all of the time, compared with half of those whose oldest is a teen. And while 55% of parents whose youngest child is under 6 said parenting was always enjoyable, the share drops to 41% for parents living with a teen. Note: This post was originally published on Jan. 3, 2017. It has been updated to reflect the Center’s newly revised definition of the Millennial generation and to incorporate more recent information. Gretchen Livingston is a senior researcher focusing on fertility and family demographics at Pew Research Center.